On August 3rd, the same day that President Rouhani officially launched his second term, South Africa’s MTN Group, a major telecommunications company, presented its 2017 interim results. As a publicly traded multinational company, MTN’s presentation had all the trappings of a modern investor relations conference: a live-stream on Periscope, a dedicated hashtag (#MTNResults), a web portal, and significant media attention. But the presentation also included something that perhaps no other company could boast—a direct and wide-ranging discussion of Iran business operations. The MTN Irancell joint-venture makes Iran one of MTN Group’s most important markets, covering nearly 50,000 million subscribers, and generating USD 1.2 billion in revenue in 2016. Iran is MTN’s third most valuable market after South Africa and Nigeria despite operating in Iran in a joint-venture. Despite the importance of the market, for several years MTN downplayed its Iran operations as international sanctions were levied on Iran. The country was mentioned sparingly in investor reports and primarily in regards to steps MTN had taken to mitigate regulatory and sanctions risks. But in a sign of the new post-sanctions environment, Thursday’s presentation, led by Group CEO Rob Shuter and Group CFO Ralph Mupita, included considerable detail on the progress MTN has made in the Iranian market, with subscriber numbers and revenues rising. Their presentation offers a compelling example of the proactive financial communications that more listed firms are bound to follow in the coming years. By way of comparison, the half-year presentation of Groupe PSA, the corporate entity of Peugeot and Citroen, made little mention of Iran despite Iran being the best-performing market and the source of key sales growth. The MTN presentation set a strong example for how Iran can be positioned within the strategic vision of a company. MTN Group is active in a number of complex markets, including South Africa, Ghana, Cameroon, and even Syria and Sudan. For Group CEO Shuter, the company mission is to “build credibility as an operator of emerging markets telecommunications.” This mission helps explain the Group’s commitment to the Iran and the appetite for the risk and uncertainty it poses. The Group’s resolve was tested as the imposition of financial sanctions on Iran had made it impossible to repatriate revenues from MTN Irancell. Following the nuclear deal, MTN was able to reestablish its banking channel, and has since repatriated nearly USD 1 billion in cash. Buoyed by the fact that Iran revenues can more reliably contribute to the group’s overall performance, Shuter noted that the Iran joint-venture is a “very high margin business” even with the “significant government revenue share.” MTN holds 49%, while Iran Electronic Industries is a relatively passive majority partner. The company expects Iran is continue to deliver growth. 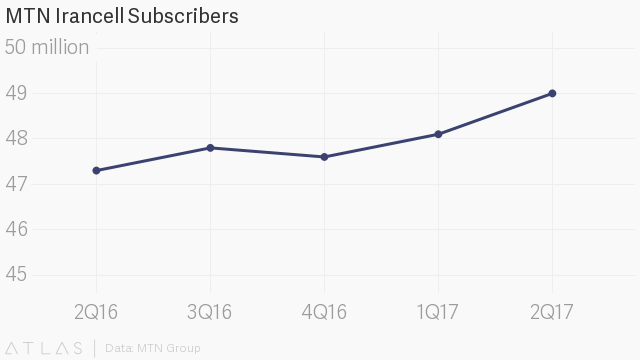 Data usage, the most lucrative revenue source for MTN, rose 160% in Iran year-on-year. MTN plans to drive more data usage through investments in thousands of 3G and 4G sites. Data revenue is already up 68% in the first half of 2017. The public disclosure of detailed operational and financial data of an Iran business unit remains rare. For globally-recognized listed company, reporting financial results is mandated. But in Iran major state and private companies listed on the stock exchange have yet to adopt best-practices for investor relations. MTN’s clear effort to report on their Iran operations in a manner consistent with other markets a kind of proactive communications that will need to be adopted by other multinational firms as they enter into joint-ventures in the market. MTN’s relatively passive partner in Iran, Iran Electronic Industries, which owns 51% of MTN Irancell, is a state-owned enterprise. Multinationals in the oil and gas, automotive, metals and mining, and infrastructure sectors are currently entering into similar engagements with state enterprises. As more multinational companies establish joint-ventures with Iran, investors both within Iran and abroad will gain access to more detailed financial results and strategic outlooks. The foreign partners (and foreign regulators) will require transparency, and these requirements could prove transformative. Finally, the MTN presentation offered a vision of innovation that did not just include Iran, but put Iran at its center. Group CEO Shuter highlighted Snapp, Iran’s answer to Uber, as an example of a market-leading start-up to emerge from an MTN-backed accelerator. No doubt, for the analysts, investors, and journalists watching the MTN interim results it was a case of “business as usual”—another well-scripted, well-choreographed company presentation. But for those with an eye on Iran, the presentation was reminder that investor relations in that market has a long way to go, particularly for those multinationals currently trading in the country. With its transparency and bold vision, MTN is setting a strong example that others ought to follow.